Focus S:I currently have a GS2 so this phone should be familiar to me immediately, the screen is great in terms of quality and size, the camera is great, has a FFC, 16gb, Battery is good, near perfect phone tbh, while its a pretty nice looking phone, here is my main problem, it feels cheap, cheap, cheap! It is lightweight and that's ok, but the plastic just feels cheap and I hate the backing, beyond that fantastic phone. Titan:Gotta say its quite the looker! Not to mention it has that HTC build quality which rarely fails, 16gb, FFC, Great Battery, Great Camera ESPECIALLY by HTC standards, this phone fixes my cheap feeling issue with the Focus S but possibly brings in a new problem to replace it, whats the problem? Possibly its biggest selling point. The Screen, now its not the SLCD as it has proven to be even better then HTC's other SLCDs which were great as is, is it the size? Not quite but it remains to be seen if its TOO big in person, so whats the problem? The Resolution, it retains the same res that every other WP and most android phones have, combine that with a 4.7' display and the Pixel Density suffers, comparing it to an iPhone for or 800, you will notice the difference. Other then that the phone seems to be near perfect, just as the Focus S! And Finally we have the 800/SeaRay/Lumia:So here we have a great Design, good Proc, 16gb, Fantasic Camera, great build quality, but here comes my 2 problems with the 800, The screen while Clearblack Amoled which has proven to be on par and maybe even better then Super Amoled, is only 3.7', now the Pixel Density will benefit from this unlike the Titan, its a little small by today's standards, a 4' on this device would have been perfect like its cousin the N9, The Focus S might be the sweet spot. Having a GS2, Im not sure I can go back to 3.7", 4"? sure but 3.7..., then we have no FFC, I mean.....seriously? With Skype coming up its a major WTF on Nokia's part, really baffling, I know people will defend it saying FFC is not really needed and most dont use it, but just remember that is YOU, not everyone is the same. Other then that it is great looking, great camera, great build but I think 3.7 is too small for me. Another issue is that it wont be coming to US as of now and to import will be a lot of money surely as its a Nokia phone. So as it stands Its gotta be between the Titan and Focus S for me, as I said the Focus S is near perfect, if it has an HTC or Nokia Build quality, I we wouldn't even be having this conversation, unfortunately though it doesn't, then we have the Titan but without seeing it in person, I cant really say if its too big for me or if the Pixel Density is noticeable. And as far as the 800, it looks great but with a 3.7' screen, not US and no FFC, and most likely a high price unlocked, I'll have to pass. Whichever I get though its mainly about the OS as I really want WP, but we all want nice hardware as well. I don't think you can go wrong with either the Focus S or the Titan. The Focus S will have NFC, while the Titan will support DLNA. Both are looking to be very nice phones. Fantastic post. It really resonates with my own thinking on this decision. If the Focus S and the Titan were to mate, they pump out the ideal phone. As you say, seeing them in person is going to be key. It feels like it's taking forever for these to appear in stores. Maybe it's because I check wpcentral multiple times a day expected an announcement about their availability but nothing comes. They can't be that far out so why not just announce a date. I doubt it will have NFC. WP7 won't add support for NFC until 2012, so I doubt Sammy would include include it. I imagine MS will want to build up an ecosystem similar to Google wallet before launching it (even though payments aren't the only use for NFC) as well as define acceptable hardware. I also don't see mention of NFC in their FCC filing. Last edited by benjiprice; 10-26-2011 at 01:54 PM. My 2 must have on my next phone was a FFC and a really good camera. Bummer - 1 out 2. You and me both man! But I suggest trying not to worry to much and dont check the site to much, I know it sounds hard as I am guilty of this as well but it will come eventually(Nov me thinks), trust me I was checking WPCentral everyday looking for info on Nokia and Nokia World, now that it has passed and it was kinda of a disappointment (for me at least) I dont feel I gotta keep checking the site or news constantly anymore, now I just sit back and wait for the Titan and Focus in stores, once they hit I check them out and I get one hopefully by Christmas, simple as that! what happen to the 7million from MS?? Nokia might have a gambling problem…..
1jaxstate1 and soulzero like this. It was part of the specs that was listed. I'll go find the page and post the link. Last edited by 1jaxstate1; 10-26-2011 at 02:12 PM. Well the Lumia hasn't been announced to hit US soil yet. So I'm hoping our version gets the FFC. I am *patiently* waiting for the Focus S... You said it "feels cheap" and I was wondering where you were able to actually hold one??? I like the 4.3" screen size but the buttons on the HD7S were a deal breaker for me and I'm hoping the Titan is better. If these mediocre Nokia phones aren't coming out until next year, I think the WP7 fans out there would like to know when they can expect their other options. Seriously Nokia, gonna miss all the U.S. holiday buyers? I had figured they were holding off on announcing the S and Titan because Nokia wanted to have first dibs on new/upgrading customers wanting the new Mango phones but hearing 2012 for the U.S. really surprised me. Probably wasn't the game plan going in but I'm getting annoyed at seeing "Coming Soon" under the phones that are actually desirable. I personally don't like the Nokia phones and I don't think I would've been impressed with them if they had come out last year with the first wave of WP7 devices- wave is a little too strong of a word- first splash of WP7 devices. Ugh I'm just venting here and I have a feeling we're probably a week away from knowing when the S and Titan will be released, just hurry it up already. Well common sense tells me that it will be the same as the Galaxy S2 which I currently have, I mean look at it, it is basically the same exact phone except with some changes here and there and a different OS, same with the Galaxy S2's on other carriers, they may look a bit different but they are the same exact phone with the same exact feeling, they are using the same exact materials, casing and everything, there's no reason to believe that the Focus S will feel different, same case with the Original Focus and Galaxy S, almost the same type of phone, same exact feeling and what not. So I dont have to hold one to know what it feels like. Sabre and Sea Ray will not be available in the U.S. (well, Sabre will be, but that's by proxy since T-Mobile is owned by Deutsche Telekom, a European carrier). As Yoda said, "There is another" and many of you have already heard of it -- Ace. The intraweb specs are pretty accurate and there are engineering protos of Ace floating around in the U.S. right now. OK, here's the link [found be bearwee (lol)] that mentions NFC for the Focus S.
It's the Michael-Dallas from Howard forums i gather? Then the only question i got for you is that when you think Ace will come out? I've looked and can't find any leaked prototype photos. Care to link some? The Focus S just makes more sense, the only reason I would consider Nokia right now is they have some really good apps that are exclusive. Nokia Maps/Drive and Nokia Music are just awesome and imo if Nokia can hit the magical 4" screen I might just buy a Nokia phone. Im buying Nokia for the software updated ESPN hub, Nokia map and drive, small compact looks like a upgraded Zune HD sold. Piff though the 800 looks nice...3.7 isn't a flagship deal breaker focus S titian them two are WP7 flagship not the stuff Nokia is showing. big waste of time. I been holding off making my pick fOR THIS....<<<bangs head>>> If the volume on the titian is better than the HD7 then it's that device if not the focus S. maybe a nokia for grampa. Okay I think I'm flip flopping. I've been looking at these videos and I'm really diggin this phone. It just looks different from any phone out there right now and it looks fun. Still no word on US launch though, so that's still a bummer. I personally think we might be a little to hard on these current devices considering they went from inception to production in only 8 months. The fact that these came out as well as they did in so short a time is no small feat and buys Nokia a little more time to ramp up the higher end gear while still maintaining a market presence. And it's not like these are the only two handsets on the drawing board. The 900 (Ace) is still yet to come and will hopefully blow the doors off everything else on the market when it does. cckgz4 and Just Visiting like this. OK, wow, you people need to be a little bit patient here. First off, the 800 may never make it to the US. That being said, let's review a few things with regards to Nokia in general. They have been on their backsides, especially here in the US. They are doing a complete shake up on a scale that we have not seen from a company in a long time. They are puttin a lot on the line placing a bet on Microsoft. Months ago Nokia said that Nokia USA in San Diego was designing devices for the US market. In the Keynote, Stepen Elop said that they were going to be delivering a "portfolio" of devices, including CDMA and LTE, in early 2012. I have a feeling that probably at CES they are going to come into the US Market swinging. The 800 is only a mid-range device. They are redoing how they do business in the US, falling in line with US model that they never went with before. The carriers KNOW as well as we do that Nokia produces some AWESOME hardware. I expect to see them hit both Verizon and ATT at least. I know their reputation for not doing CDMA, but I honestly believe this, much needed, overhaul is going to be a game changer and CDMA is VERY much in play this time around. Now lets be honest, out side of the relatively small community of tech people, the average person that walks into ATT, or Verizon or best buy, and see the 800, a lot of them are going to walk out with it, just because of the outstanding design and look. 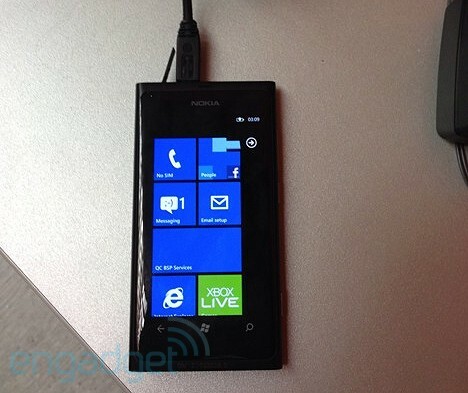 The 710 is showing up on the Nokia USA as coming, and will probably be $99 on contract. Yeah, most of us would not go with this one, but there are is a huge market for the cheap smartphone. aubreyq, smartpatrol, threed61 and 2 others like this. Who said anything about a 12mp camera coming on a Nokia WP7 phone anyway? This isn't all Nokia will be bringing, remember that. There's supposed to be 12 Windows Phones next year. I think this is a great entry, because it brings the same sense of symmetry and professionalism that the iPhone commands. Let's face it - many people out there in fact won't be craving for a 4.3" screen on their first smartphone. smartpatrol and Just Visiting like this.